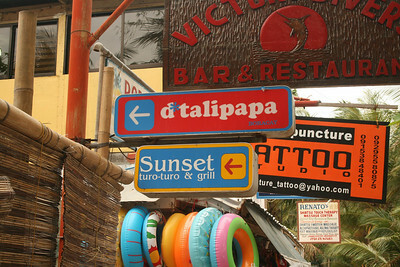 D'Talipapa is considered a must dining stop in Boracay. The main hook is being able to shop for the seafood you like and then choosing a carinderia-style restaurant to cook it for you. I'm sure it's a great come-on for foreign visitors but Manilenos are already used to the concept (Dampa and Seaside). However, seafood here is still cheaper than the ones sold in Manila. 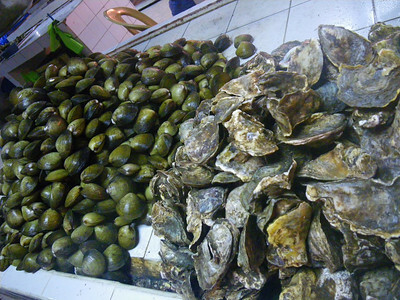 At the time we went there (mid-July), oysters can be had for as cheap as P25/kilo while clams sell for P50/kilo. 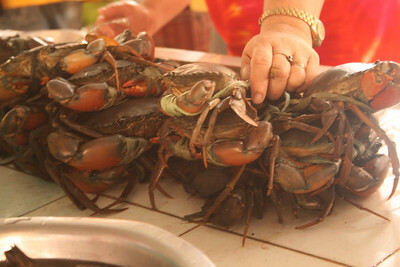 Monster crabs sell for P300/kilo and lobsters (depending on size) start at P800/kilo. 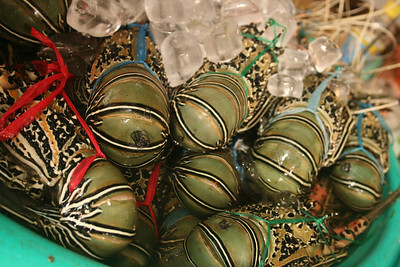 Vendors will even tell you if their lobsters came from Palawan and everything is guaranteed fresh or alive. The seafood market closes at 8:00 PM so diners should be there way before that to be able to shop and haggle at their own pace and have ample time to wait while dinner is being cooked, and then enjoy it. 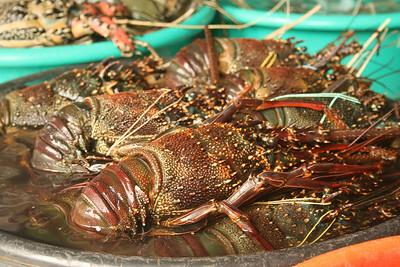 Some restaurants only cook bought seafood and do not offer a la carte menu (like the famous Plato D' Boracay and the one beside it, the two nearest establishments to the market). Some also offer cheaper cooking rates plus a la carte menu (like Angel Wish Dish) with meals averaging P140 (rice/other carbs plus main dish). Is it really cheaper to eat here? Not necessarily. I believe a bigger group of people benefit the most from the system since more people will be chipping in the expense, and more people will be sharing the food. Unless your hotel/inn has a fridge or cooking facility, vacationers won't really like bringing home their leftovers. Plus, you may want to eat something else the following meal/day. Also, some buffets offered by the beachfront restaurants can already give someone her shrimp, crab or oyster fix. While waiting for your meals to be prepared, you can shop at leisure and haggle to your heart's content in the many stalls in D'Talipapa. It is the cheaper alternative to shopping over D'Mall. 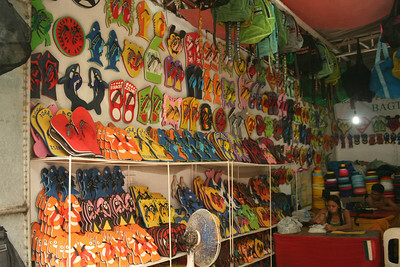 From souvenir shirts and key chains to shell and pearl jewelry, bathing suits and sundresses as well as footwear, and even musical instruments and home decor, all can be seen and bought in D'Talipapa. 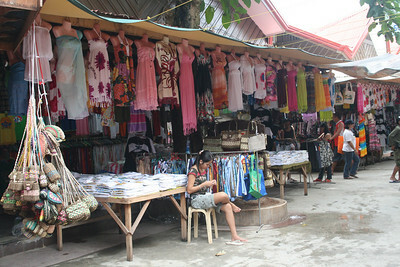 What's greater still is that the prices of the goods here are very affordable and competitive, considering Boracay is a high-traffic foreigner destination. Shirts for kids and babies can be had for as cheap as P70 while big shirts cost between P180 to P240. Sundresses and wraps average P180-250. Necklaces that cost P200 at department stores can be bought here for as cheap as P40-80. And the cloth chandeliers with bright, festive prints can be bought for 5 for P100. As a fellow vacationer would say, "Presyong divisoria!" D'Talipapa can be reached via tricycle through the main road for those who don't like walking. Most drivers charge P50 per trip, however. And unfortunately enough, getting to D'Talipapa from the beach during the rainy season may require some wading through flood or balancing/stepping on makeshift bridges and sand sacks. 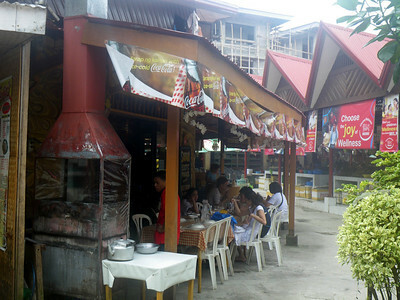 There are also other dining choices in D'Talipapa, like Andok's and Mang Inasal franchises. There's also a mini-grocery there and vegetable and fruit stands so vacationers can really take advantage of their hotel's cooking facilities and just shop for ingredients but cook the food themselves. That way, they can really eat grandly but not so expensively. 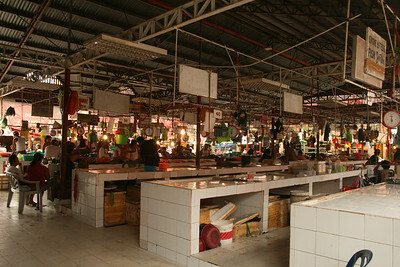 Pasalubong items like piaya and pastillas and other goodies can also be bought here. And in everything you're thinking of buying, make sure you go around the stalls first before buying because some really offer the same products at cheaper rates. Every peso saved translates to more disposable budget, after all.